Please may I have my spawn location different this time? I already described it once or twice that you may change spawn location, but the quest progress and companions you've made is lost / reset. Items and spells are kept. Imported characters gain a Veteran Bonus of keeping their items and spells. Quest, adventure progress and companions is kept if they continue from where they left. Yeh I just wanted mine changed thought I would ask nicely... didn't intend it to show I was ignorant. Do some races have inherently different stats than others? So... What location type would you like to spawn in out of desert, city, etc..? Races has the same stats, however later on races will have different abilities that's for the moment secret. Some races also get certain stuff faster while getting stuff later, but that's to be revealed. By the way, last game I encountered a pokemon spawn. I have processed Calix, deathworlds and SuperJack so far. Some passives has been removed, but it'll be reintroduced quite soon when I've rebalanced them. Expect certain nerfs or buffs. Tomorrow when I'm home from work, I'll process the initial start. Edit : TDL is also done. Edit : There goes Secondpassing. All characters has been processed and spawned. Last edited by RLVG; July 31st, 2016 at 02:14 PM. There may or may not be a couple more people coming. They're just.. hesitant. hey it's august 1st almost everywhere now, is it time to start? 2 AM here on west coast, I'm ready for this. Even if I fall asleep right before game start. We are witnessing a legendary remake of the game, this time with only seven players. There's nothing too significant to talk about during the very start other than to wish them all good luck. A worldmap is still in the WIP progress to make it easier to interpret. For now, just simply go with "Go North" or similar command. Host has forgotten about writing in money which was planned, so that'll be an automatic thing for Turn 2 instead. Most landmasses has been given a name. The unleashed nuke has been retconned and made the city an artificial snow biome instead. If you feel like using the bad map though which could've been improvised, here it is in a spoiler. 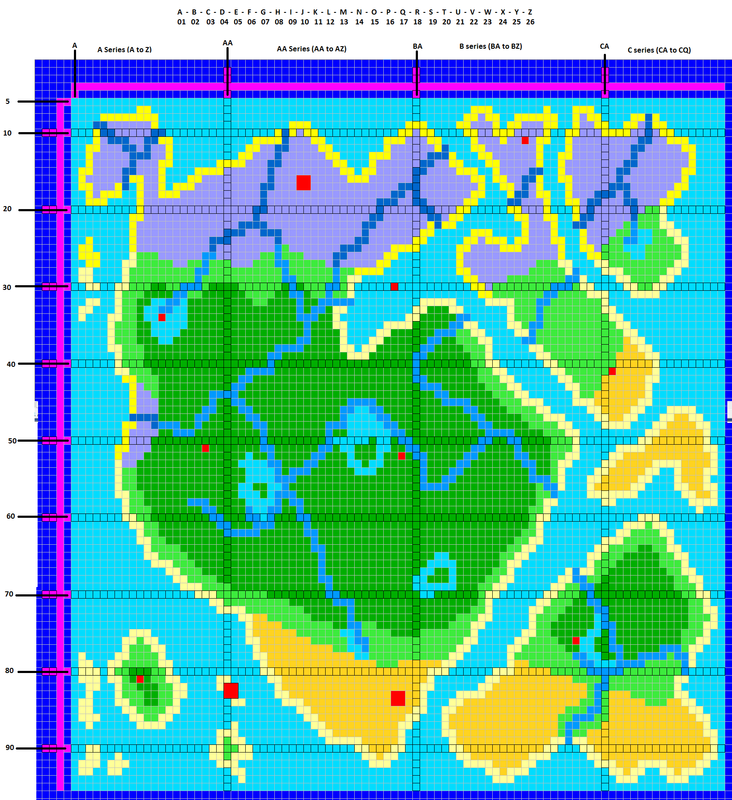 Cities are supposed to be single-tiled and the artificial snow biome isn't shown on map. Last edited by RLVG; August 4th, 2016 at 08:44 AM. APPA HAS SUBMITED AN ACTION. That's right. I have a Bible. For everyone else: it's giving a different narrative. I suggest you all getting your own Bibles. The pious shall dominate the land. I'm assuming I can only use a resource once per turn (whee new wording). Some of the players here are known bookworms. Looking at you APPA, Callahan. 1.If we can't focus for movement (give up other actions to move two spaces), can we focus for actions (give up every other action) to read more? C=1 Is count? If that is true the 1x is a bit redundant. That or "C" stands for something else. 2.What does W and C stand for? Have you decided on a weight limit? 4. I realize broadcasting my location is game breaking(?) Just curious if you thought of limiting out-of-game/thread communication. 2. What does W and C stand for? Anyone may sign in to play the game at anytime. If you're too late for the initial start party, don't worry - you can catch up with the others. 4. Just curious if you thought of limiting out-of-game/thread communication. RESPONSE: APPA HAS "SPED READ" HIS BOOK, READING IT TWICE AND COMPLETING IT. APPA ASSUMES ANY ENTITY IS CAPABLE OF POWER READING. Also, I've thought of a way to add RLVG into the game, but we would have to gimp his character. It would require us to co-host him in, and each of us would dictate his surrounding narrative every turn. Strings of disappointments led you to lose your sanity. Your bio-mechanical body is an interesting combination between durability and weakness. The fleshly part (shields) take two times as much damage as regular health, but your mechanical part is twice as durable as regular health. Since the binding between demon and teknid is fragile, your body is accordingly volatile. - Fallen God, hated by all NPCs. Interactions with players limited to neutral/agressive. You may not attain anything higher than 0/52 Sanity.